1) For orders either email me at marcus@goodfellowfamilycellars.com or just post in this thread. 2) Shipping is $20 flat rate per box, up to 12 bottles/box. We can’t ship to a few states (Utah etc. ... Massachusetts will hopefully be licensed sometime in February), email if you have questions. 3) Information on the winery? Please see the Sponsor posting viewtopic.php?f=73&t=157786, or feel free to ask any questions in the thread. 4) For more detailed information on the BD 10 wines, please scroll down through this thread, or feel free to ask questions in the thread. Chardonnays are old school. Vineyard before cellar. Spine before flesh. 820L Foudre for elevage, 20 months on the lees, racked only before bottling. These wines represent the very highest achievements in vineyard, vintage, and my winemaking. The #7 is a wine I would cheerfully place in any blind tasting of 1er Cru Burgundy wines. The #8 is my favorite Durant bottling to date. They are the best of my Pinot Noirs in 2016, showcase two tremendous terroirs, and the case price is the best price they will be offered at this year. Goodfellow is almost exclusively wines from single terroirs, with only the entry level Willamette Valley bottling as a wine from multiple vineyards. 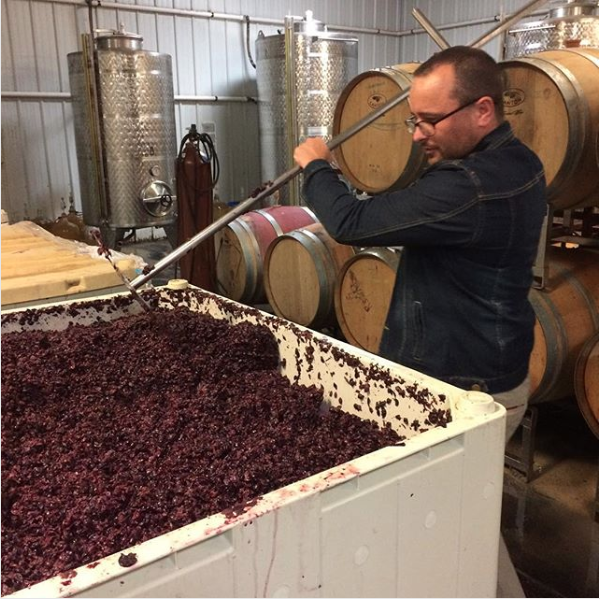 Over the past month, I have been hammering out the cuvees for our 2017 Pinot Noirs and Chardonnays. To celebrate BD 10, I'll pull one barrel apiece of vineyard designate quality Pinot Noir from three great vineyards. Whistling Ridge(60% whole cluster), Temperance Hill(66% whole cluster), and Durant(100% whole cluster) and blend them to create a Berserker Cuvee for BD 10. Barrels are 3-5 years old. The Whistling Ridge is from the House Acres that were the first planted at the vineyard in 1990. The Durant fruit is from 114 clone planted in 1998, and the Temperance Hill is from the Pumphouse block of Dijon 113 and 115 planted in 1994. 2017 is a magnificent vintage for Oregon in a classic sense rather than a "riper is better" sense, and these wines have beautiful delineation, nuance, and a vibrant core of fruit. 73 cases total, 68 for sale...750ml bottles, not liters. These components are still in barrel, will bottle in June, can be picked up after July 1st, or will ship in the fall. Last edited by Marcus Goodfellow on January 26th, 2019, 7:05 pm, edited 5 times in total. The Richard’s Cuvée is drawn from Dijon and Heirloom clones inter-planted together in a single ridge-top acre. In 2016 this wine is restrained, elegant, dense, and rich. Dried flowers, fresh baked bread, sea grasses, smoke, almond paste, and cantaloupe, with a linear finish of zest and crushed oyster shells. Sourced entirely from two 820L foudres. Last edited by Marcus Goodfellow on January 26th, 2019, 3:55 pm, edited 2 times in total. Oh snap! A Berserker cuvée! All of these offers look pretty great Marcus! From Dijon vines planted in 1993, the volcanic soils of the Durant vineyard provide remarkable Chardonnays. In 2016 the texture is rich and delicate while retaining vibrant purity, linearity and effortlessness. Floral, with lime zest and golden fruit, fresh grain, fennel seed and almond. IMO, this wine is lovely when young and one of my most approacchable wines. However, I am always surprised at how serious a wine it ages into. Last edited by Marcus Goodfellow on January 26th, 2019, 3:55 pm, edited 1 time in total. BTW, Marcus, very cool of you to follow in the "Jim Anderson" tradition with a Berserkers Cuvée - I will be definitely in for a case of this. The vibrant juiciness of the 2016 vintage paired with the natural structure of Whistling Ridge brought us an extraordinary pair of vineyard designate wines, from one of the truly great sites of Oregon. The single vineyard bottling shows red currant, black cherry and brown spice, with roses, perfume, deep savory herb, dried ginger, peppercorn, and a sweet citrus pith. Heritage #7 was drawn from two puncheons of the Beloved Acre block at Whistling Ridge. Velvety red currant, strawberry and kirsch, with tobacco leaf, cedar, candied ginger, and heather. Extraordinary precision and layering, density and structure to cellar through 2035. Whistling Ridge Vineyard sits ridge-top in the Ribbon Ridge AVA. Planted, and farmed by Patricia Gustafson and Richard Alvord since 1989. Last edited by Marcus Goodfellow on January 26th, 2019, 3:56 pm, edited 2 times in total. You were the obvious choice for this years Chardonnay offering! The fruit off of Durant Vineyard in 2016 produced a perfect balance between juice, fine skin tannins, and acidity. The single vineyard shows warm red fruit and dried strawberries, accompanied with woodsy notes, leather, depth, and exotic spices. The Heritage #8 is a selection of only two puncheons that were of even greater quality and balance from the very beginning. Elegant, silky and plush, with intense floral notes, tobacco leaf, black tea, and pure red fruit. Last edited by Marcus Goodfellow on January 26th, 2019, 3:58 pm, edited 1 time in total. Tucked into the the coastal foothills far into the south-west corner of the Yamhill-Carlton AVA, Fir Crest Vineyard is one of Oregon's most under the radar gems. Pinot Noir from this site is dark and intense, yet somehow elegant and precise at the same time. The nose on the 2016 bottling is smoke, forest floor, layers of Boysenberry and Marionberry, stem spice, and a perfectly balanced savory finish. Our 2016 is 100% Wadensville clone, marked by tight, tiny clusters, and the modest yields of older vines. I feel like I need a count down clock. Very excited about your offer. The last couple of days have been full to say the least. Working out whether we could pull off the bottling, and making sure the wine would be a wine we could be proud to present for BD 10. Because it was on the fly, we knew it would need to be a smaller run with high potential quality. The 2017 wines helped out the cause quite a bit. It’s a lovely vintage with a high percentage of exceptional quality. We’ve been tasting through the wines for final blends, which also helped. Working out which barrels would make the best Berserker Cuvee, and making sure that the wines they’re pulled from wouldn’t suffer still took quite a bit of time. The 2017 Temperance Hill fruit was extraordinary. A brilliant red fruit core with the sauvage of the vineyard. Our fruit is in the Pumphouse Block, and is older Dijon clone. Up at 800-850 feet and hit by wind from the Van Duzer corridor it is intensely flavored with thick skins and a wild nature. This has 66% whole cluster giving it the linear restrained nature, floral and spice tones alongside the power and snarl of Temperance Hill. Whistling Ridge gave us the most material to choose from since we have the entire vineyard. But there is a little roll to the south in the House acres and they get just a little more warmth, along with having the oldest vines. At 60% whole cluster it’s just a beautiful red fruited, semi-tightly wound, with the same array of red fruit, spice, and herb that is a signature of the vineyard. The Durant barrel is from a block of 114 clone about half to two thirds of the way up the east facing slope of the main vineyard. The volcanic soils in the Dundee Hills are a little deeper and hold water a bit further into summer here. Even at 100% whole cluster this is the silkiest and most succulent component of the Berserker Cuvee. It provides a slighlty deeper range of flavors to the blend, moving to boysenberry, black raspberry, deep cherry and hints of garrigue and violets. The layering and length are exceptional, and they do play well together(always a worry with Pinot Noir). I would expect a decent early drinking window (with air and food). Marcus, I just wanted confirmation on my case of the BD Cuvee. Thanks. Email sent for 6 pack of 2017 Berserker Cuvee! I’ll take a case of the Berserker Cuvee and a six pack of the sean Smith. Email sent for a case of Berserker Cuvee and a Sean Smith 6 pack! I'm really looking forward to trying these wines! Email sent for some Berserker Cuvee. Can't have to much Berserker Cuvee! Email sent for the Bob Hughes and Sean Smith packs!! Email sent. Thanks for the offers. The 2015 Heritage No. 4 Whistling Ridge remains one of my favorite wines from recent Oregon visits, so I'm excited to try the 2016 Heritage #7 and #8 and the 2017 Berserker Cuvee. E-mail sent - Holy crap in for 3+ cases - and in on all offers! Can't have to much Goodfellow in the cellar. In for my namesake 6 pack and case of the Travis Fantz. Awesomeness Marcus. Berserker Cuvee lives on!!!!! Email sent but just in case, I'm in for a Bob Hughes and Sean Smith. Thanks! I am looking forward to checking out the other offers and burning up one of my credit cards on some of the other offers too! Thanks for resurrecting the Berserker Cuvee! 1 case of the Greg T (I assume that would mean 6 of each bottle?)? Thanks for the love! That's a perfect Goodfellow insta-cellar. For the Greg T case, it's 6 and 6, but if you have a preference between the two just email me. Email sent, I've quickly fallen in love with the chardonnays. Email sent. In for a Bob Hughes Sox pack and some pinots. Drinking a ‘15 Fir Crest PN right now and it’s delicious! Last edited by Sean_S on January 27th, 2019, 9:35 am, edited 1 time in total. Hi Marcus! I think I'm in for a case of the Berserkers Cuvee! I know my wines have a reputation for needing time to come around(sometimes a lot of time), but that 15 Fir Crest is just beautiful. I liked it when we bottled it, but it has really just opened up into a "why wait?' bottle. Great wine to pair with some BD shopping! Ok, gotta pull the trigger here. A sixer of Berserker Cuvee must find its way to my cellar. Email forthcoming. Email sent! In for the chards and 2016 pinots! Email sent. Couldn't resist a case of Berserker Cuvee. Sent an email for a case of the Berserker Cuvee. Can't wait to try it!